Custom engraved key chains and leather key fobs with the 4-H logo. The 4-H National Headquarters has extended authorization for Horse Smarts to use the 4-H name and/or logo on engraved awards and gifts items. We have a large selection of gifts and awards already but if you are looking for a specific item and do not see it here please let us know and we will do our best to get that item for you. 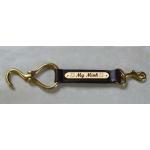 We also have a large selection of horse designs and farm animal designs available on this site. If you would like to use the 4-H logo and one of our other designs together on a gift or award please email us as we would be happy to work with you to create a unique 4-H award or gift. 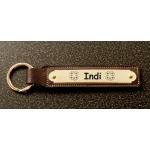 Custom engraved key chains and leather key fobs with the 4-H logo.